OmniPlan is designed to help you visualize, maintain, and simplify your projects. Break down tasks, optimize the required resources, control costs, and monitor your entire plan—all at a glance. Collaborate with your colleagues and share every detail, update a calendar with your days off, or mix and match. Accept and reject changes one-by-one or all in one go. OmniPlan provides features like Gantt charts, schedules, summaries, milestones, and critical path highlighting to let you manage all of your activities. From customizable views to fast data entry, OmniPlan helps you manage projects that are as simple or complex as you need them to be—without the complexity. • Publish & Subscribe [NEW! ]: Stop, collaborate, listen. Make changes to your project and see those from your collaborators with syncing; customize your availability and have your colleagues' calendars update instantly. Mix and match your publish and subscribe actions to meet your needs. • Change Tracking [NEW! ]: Use change tracking to keep tabs on and review the changes you've made in your project so far. If you're syncing, use change tracking to review, browse, and then accept or reject changes (task by task or en masse) from your collaborators. • Friendly Interface: We designed OmniPlan to help you spend your time on more worthy pursuits than trying to figure out how to use project management software. OmniPlan's intuitive approach helps you get things done and stays out of your way while doing so. OmniPlan has several customizable views starting from "simple creation" for basic planning options; when you're ready for more sophisticated functions, OmniPlan can be configured to meet your needs. • Data-sharing options: OmniPlan can import XML, MPX, and MPP project files from Microsoft Project 2003 - 2013, as well as OmniOutliner, OmniGraffle, and CSV files. OmniPlan exports information to iCal, CSV, Microsoft Project (MPP), Microsoft Project Exchange (MPX), Microsoft Project (XML), HTML, OmniOutliner, OmniGraffle, and a variety of image formats. You can create detailed HTML reports with OmniPlan, and use filtered criteria for customized printing and exporting options. • Efficient resource allocation: With OmniPlan's resource management, you can identify bottlenecks in your project, track budgets, and distribute workloads fairly and efficiently. 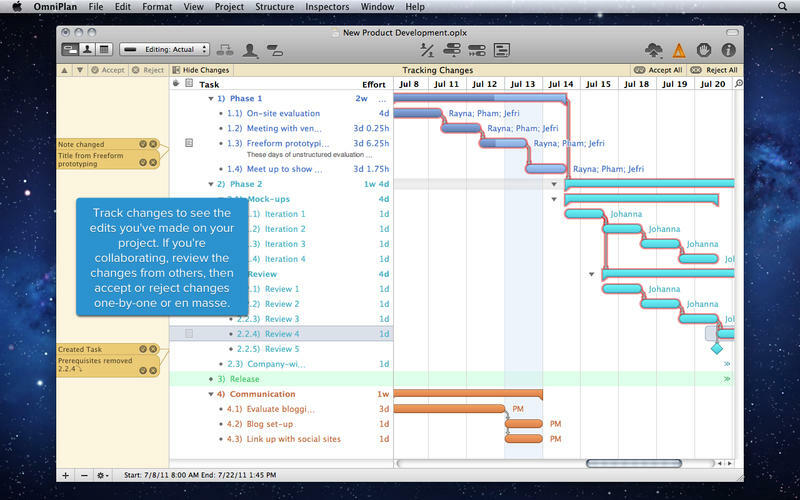 • Visual timelines: The Timeline (or Gantt Chart) view of your project displays activities in a calendar. Durations for each task are shown graphically in a time-phased diagram by day, week, month, quarter, or year. 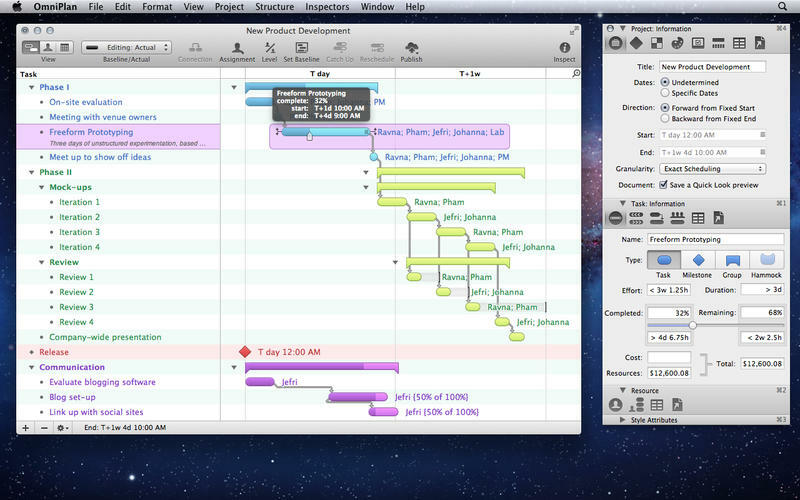 The Gantt view shows task start and stop times, dependencies, resources, or resource usage by task, all on a timeline. You can visually edit tasks and create dependencies (where a certain task can't begin unless another has finished) by dragging and connecting them in the Gantt view. OmniPlan's graphical display of your project's information helps you quickly assess status and proactively manage deadlines. • Violations and critical paths: If your schedule has a logical impossibility – for example, the scheduled start date for a task occurs before the project start date – OmniPlan displays a violation window, with an explanation of the problem and suggestions of possible solutions (and links that automatically resolve the violation). In the Gantt view, OmniPlan displays your project's critical path, which is the series of tasks that are necessary in order for your project to finish on schedule. The critical path can change as you progress through your schedule; OmniPlan keeps you up to date so you can make informed decisions. 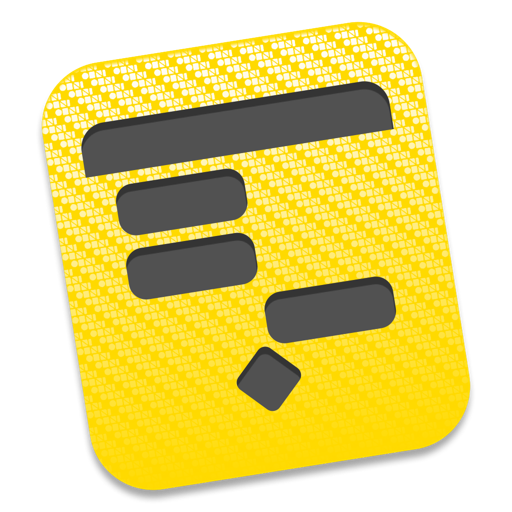 OmniPlan 2.4.1 contains bug fixes, improved stability, and updates to the help documentation. • The in-app help has been updated with new images and improved documentation on certain features. • Fixed a bug where the horizontal scroll bar would obscure the last task in a project. • The Project Information inspector now updates correctly when the granularity setting has been changed. • In some cases, v2.4 produced different leveling results compared to 2.3.7 due to a previous leveling fix. The results are now consistent. • Fixed a bug where automatic leveling could adjust baseline dates. • Realigned the Accept All & Reject All toolbar buttons to the right side of the Change Tracking toolbar. • The Change Tracking toolbar buttons were missing in localized versions of OmniPlan. • Corrected the Spanish translation of “Task” to “Tarea”. • “Task” and “Resource” are now displayed in Chinese when using Chinese localizations. • Removed duplicate menu items for expand/collapse rows from Chinese localizations. • Fixed a crash that would occur during file save. • Showing and hiding the Change Tracking view no longer crashes. • Removing a publishing action was crashing the app in rare cases. • Showing the Action menu in the Resource Information Inspector no longer crashes. • Fixed a crash that occurred when parsing certain date formats in the Task Schedule Inspector. • OmniPlan no longer stalls when generating a large Quick Look preview during a file save. • Fixed a crash with updating completion percentages on tasks. • Choosing “Print Report” from the Print panel no longer crashes. … and much more! For more release notes, please see our website. We love hearing from you! You can reach us by choosing "Send Feedback" from the Help menu, sending email to omniplan@omnigroup.com, tweeting to @OmniPlan, or calling 1-800-315-OMNI or +1 206-523-4152. This version of OmniPlan 2.3 employs security features in Mac OS which are new to version 10.8 and will not run on earlier releases of Mac OS X.
Syncing OmniPlan 2.3 documents to the iPad requires OmniPlan for iPad version 1.3 or later. • After quitting and relaunching OmniPlan, HTML Full Reports export actions no longer produce a “File does not exist” error. • Fixed a bug where iCal calendar subscriptions could produce an “unrecognized selector” when updating. • The right combination of complex resource dependencies could lead to a crash when marking tasks as completed. This has been fixed. • Changing a resource group to a staff resource after it has been assigned and resource leveled could corrupt the file and result in data loss. This has been fixed and previously corrupted files now load correctly. • Publishing to iCal Events could get stuck in a loop, infinitely refreshing itself. We no longer refresh in the middle of saves, fixing that issue. • Publishing to iCal Events is now better at identifying any calendar events previously published to represent your tasks and updating them, rather than creating new, duplicate events. • The popup toolbar button (Update, Publish, Assignment, Connect, Critical Path) will once again popup their menus. • We now prune resolved change log data more frequently to keep file size more manageable. • Fixed a crash caused by plugging and unplugging external monitors. If you are still able to reproduce this bug, please let us know! • Added an Open Scripts Folder menu item to the Help menu and a link to the Execute AppleScript configuration. This is the directory AppleScripts need to be placed in to by run by the app. • Fixed pixelated rendering of task labels on printouts of the Gantt view. • Fixed bad scaling in the timeline view that could give the view a distorted appearance on printouts. • If you allow leveling to split tasks into chunks with a minimum duration, it may now split at the end of the completed portion of the task, even if that makes a task chunk with a smaller duration than allowed otherwise. • Task labels atop task groups now pick a font size that should fit on the bar regardless of any styles applied to the row. • It was possible to get into a state such that when saving a file, the save panel showed you the place you want to save, but when you clicked “OK” it returned an error such as “The file [filename].oplx does not exist”. This has been fixed. • Fixed a crash that could occur when changing a project from specific to undetermined date mode. • The completion slider in the Task Information inspector got its groove back. • Fixed a crash if you close the inspector window while you have pending text changes in the Resource Assignments inspector. • Fixed a crash caused by modifying a style while editing text in an outline view. • Fixed a crash assigning material resources in resource groups to tasks. • Fixed a rare drawing error in critical paths on PDF exports. • Week-spanning schedule exceptions now display on all weeks they span under Extra & Off Hours. • Some calendar events were being improperly discarded on input. • Sync tasks to/from iCal events actions should find the users’ calendars once again. • Creating a task with the ending date property now works properly. • Fixed a missing entitlement log during sync.